Junior League cookbooks are almost always good. I say this not as a League member, although I am one, but as a long-time aficionado of thrift store cookbooks. The very best ones are usually food-stained and dog-eared, with pencilled-in additions and substitutions. They're usually a pretty good indicator of place, with regional ingredients and customs shining through every recipe. I'm particularly fond of the southern tomes, with their focus on entertaining elegantly, even at potlucks. In the old days, they were spiral-bound with mimeographed typewritten pages but today's JL cookbooks are as high tech and multifaceted as the League itself has become. There are now almost 300 chapters internationally and over 200 Junior League cookbooks in print currently. My chapter, Junior League of Wichita, just released its third cookbook Pinches and Dashes: Recipes & Life Measures from the Junior League of Wichita. It has already sold over 6000 copies since late November and I can vouch for its awesomeness. The women on the JLW cookbook committee worked for several years gathering thousands of submissions from our membership and local committee, then they meticulously tested each recipe, doctoring them to ensure that the final 180 compiled in Pinches & Dashes are not only tasty but that they are virtually mistake-proof. Each recipe is simple enough for even a novice cook to prepare with dramatically delicious results. P&D also looks amazing, with mouthwatering food photography and a sleek, contemporary design to rival those by your favorite celebrity chefs. 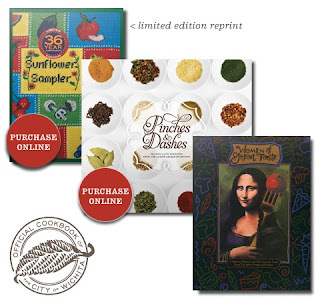 Compare that to the homespun charm of the Sunflower Sampler, JLW's first cookbook from 1973, and you'll have a visual reminder of just how far our League has come and where we are headed in the new century. I would be hard-pressed to pick just one favorite recipe from Pinches & Dashes. There are quite a few that have already become part of my culinary repertoire. (And, of course, you can try and guess which one was I submitted. I have to admit, they doctored it and made it better!) The Bacon Cheddar Scones and Blue Cheese & Caramelized Walnut Soufflé are to die for and Cuban Pork Tenderloin Salad is amazing. The one that sells a couple of books every time I make it, without fail, however is on page 150: Cinnamon Chip Snickerdoodle Blondies. I am a total chocolate fiend and generally frown upon desserts that don't include it but these are UNBELIEVABLE. Trust me on this. They might not look like much but you will want to eat your weight in them. So good. I did make them with a handful of dark chocolate chunks and pecans tossed in for good measure and it was almost overkill. Not that we didn't eat the whole batch in a day. Crazy, crazy good and so easy to make! Pinches & Dashes is available in retail locations around Wichita and online. Follow Pinches & Dashes on Twitter and Facebook, too! In accordance to the FTC Guidelines and the WOMMA Code of Ethics, I am disclosing that I am a member of Junior League of Wichita. I didn't receive any compensation in exchange for writing this; in fact, I bought a case of cookbooks on my own volition to give to friends and family. All opinions are, as usual, strictly my own. 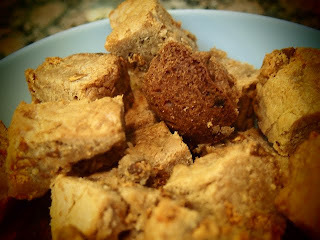 Cinnamon chip snickerdoodle blondies? These sound deadly! Love that flipbook! They *are* deadly, not least because they're so stinking easy to make! The cinnamon chips are the hardest part because they're seasonal but Hershey's has a product finder so you can see where they're in-stock near you: http://www.thehersheycompany.com/contact-us/locate-hard-to-find-products.aspx?HG_ID=HCOMP011 Not that I'm advocating buying a dozen bags and hoarding them, mind you… Oh, wait, I totally am!